Home » News » Love is in the Air! It’s almost February, the month of love and couples and good sweets and heart shaped things and pink and red! For some, Febuary 14th is an exciting day for love and for others it’s a great excuse to indulge in foil wrapped Dove chocolates and cocktails. Either way some type of food or other Valentine’s Day themed things are somehow coordinated into the day. Whether you’re attending a Valentine’s Day party, preparing a romantic dinner for a date or drowning in sweets and drinks here’s a little LOVEly inspiration for your February 14th wherever it may be. Brownies and cheesecake are divine sweets but mixing the two together is simply genius. 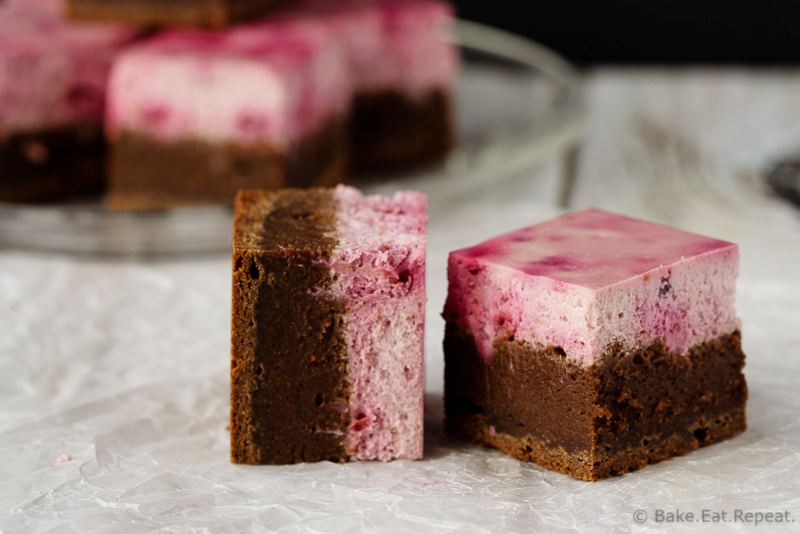 All you have to do for these Raspberry Cheesecake Brownies is make the brownie layer and add the cheesecake layer on top and that’s it! But if you want a little bit more detailed recipe keep scrolling. Cream together butter, sugar and brown sugar with electric mixer until fluffy. Add eggs and vanilla and mix again until combined. Add flour, cocoa powder and salt and mix until combined. Spread brownie batter in 8×8 inch baking pan lined with parchment paper and set aside. combined. Fold in the raspberries. Spread cheesecake mixture on top of the brownie batter. Bake for 50-60 minutes at 350 degrees. Cool for an hour and chill for 2-3 hours before cutting the bars into squares. After those amazing cheesecake brownies you’ll probably need something to wash them down. Next up, raspberry pink champagne floats. This recipe only makes one so if you plan on sharing (or drinking a few yourself) you’ll have to double or triple the recipe! – Eat with a spoon or sip with a straw! If you’re planning to host a party this Valentine’s Day you probably already know that balloons are a huge trend this year! See how you can amp up your simple party balloons with some themed colors. -Stretch each balloon. Insert funnel into balloon and add glitter using a spoon. Adjust amounts to achieve desired color. -Using pump, inflate each balloon. Knot balloon. Attach strings to them or create an arrangement on the wall!